Da Ya, translated literally as "correct with beautiful virtue", is the title of part three of the four traditional divisions of the Book of Songs,4 a collection of 303 ancient song texts which Confucius and his school made so much use of (often by finding wild allegorical meanings to support their moral positions) that they came to be attributed to Confucius himself either as composer or compiler. There are no early references to Da Ya as a qin melody. However, the title can be found in at least 43 handbooks to 1894, all in this huangzhong tuning.5 The first five, to 1539, are all very similar, but then (skipping Chongxiu Zhenchuan Qinpu  with its usual idiosyncratic adaptation to lyrics) from 1589 it becomes a vaguely related but new melody, the basis for all future surviving versions. The Da Ya section of the Book of Songs has 31 song texts divided into three sections. In the translation by Xu Yuanzhong,6 the title Da Ya is rendered as Book of Epics. These songs record the historic deeds and comment on the lives of such people as the early Zhou heroes Wen Wang (Civil Prince), his brother Wu Wang (Martial Prince), and Wen Wang's son Zhou Gong,7 as well as many of their ancestors and descendants. Most of these events took place in the vicinity of modern Xi'an. Because of the status of the Book of Songs, throughout later Chinese history various efforts were made to apply music to the lyrics in styles thought to be authentic. Zhu Quan may be referring to documents of such efforts made during the Tang and/or Song dynasties. There seems to be a suggestion in Zhu Quan's preface to this piece that its music came from outside the qin repertoire, as though there was then in existance music (court music?) in separate Xiao Ya and Da Ya styles. To my knowledge there is no way to examine the significance of this suggestion. A kingfisher on the window screen, the night has not ended. The screen and the bright moon come together in the middle of the palace. this piece was created by Zhou Gong. In general, when Zhou Gong was building the basics of the nation, he put great value in people of the same clan; in order that all under heaven be one family, he used relatives to rule them. As a result a situation didn't arise where outsiders could cause an overthrow, and he was able establish a kingdom which lasted 867 years; this is why his reign was the longest one ever without collapsing. (A preface to) the Shi Jing says, "Ya (elegant) means zheng (correct)." Songs of correct music (in the Shi Jing) are divided into Da (Great) and Xiao (Small) Ya. At first the Confucians distinguished between zheng (correct) and bian (altered) (versions of Da Ya and Xiao Ya). Zheng Xiao Ya was Music of Inviting Guests to Dinner; Zheng Da Ya was (both) Music of Imperial Audience, and words for prayers in (royal) ancestral worship. The happiness and harmony fulfilled the emotions of all the king's subjects; the respectfulness and solemnity made known the virtue of previous kings. Because the lyric styles were not the same, and the musical rhythms were also different, hence there was a difference between Da Ya and Xiao Ya. I have thus cut off and discarded Xiao Ya's Inviting Guests to Dinner music, using only the music of Da Ya's correct sounds and editing them for publication. (04.39) 9. The Decree of Heaven is with the Zhou dynasty. 5960.1273 大雅, besides discussing its position in the Book of Songs, says "zheng er you mei de" ( 正而有美德 ). Zhu Quan repeats the tuning method here for some (or no) reason. This is, for Wuyi (or Huangzhong) mode tuning, slacken 1st, tighten 5th strings each a half step. For more details on this mode see Shenpin Wuyi Yi. For more on modes in general see Modality in Early Ming Qin Tablature. The image is from Sancai Tuhui. It is not clear how the authors came up with their "historical" images of people. Book of Hyms (Song 頌 ); 40 poems in 5 sections. In addition there are various prefaces and other commentaries never translated. 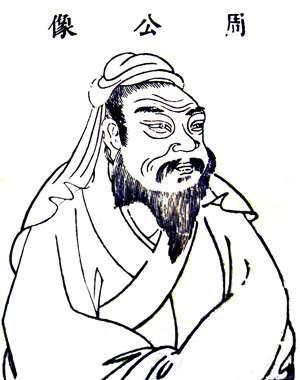 One such preface is the source of the quote given by Zhu Quan, "Ya means Zheng (雅者正也)." His next sentence seems to be sayin that sections two and three are together considered "Songs of correct music (正樂之歌)". See Zha Fuxi's Guide 8/80/131; two have lyrics. My comments about the "vague relationship" between the first five versions and those beginning in 1589 is based on a casual examination of the later versions: more research is needed to explain more precisely how close or how distant the early and later versions were, not to mention the need for better descriptions of the differences in the later versions. 6. An Unexpurgated Translation of the Book of Songs, Translated, Versified and Annotated; Beijing, Panda Books, 1994. See Introduction, p.24. 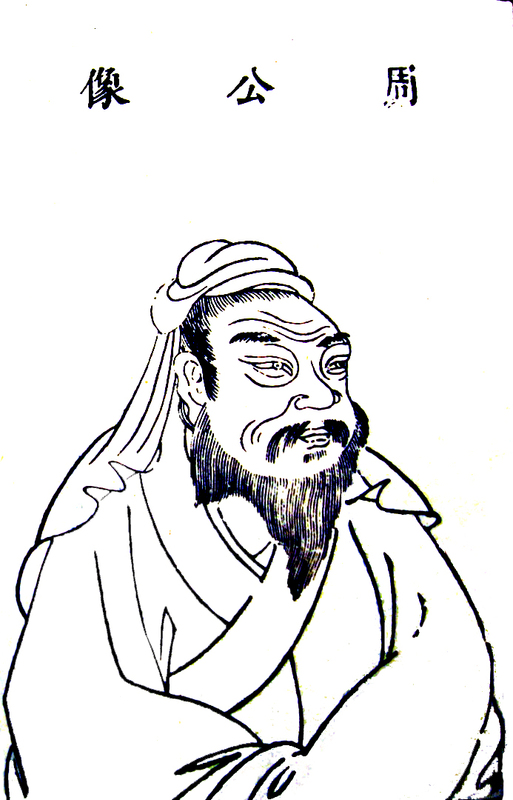 12th c. BCE; brother of Wu Wang, generally considered to have been the first ruler of the Zhou dynasty. A modern edition includes 70 poems. The program notes on the CD (Liezi Yufeng, ROI RA-001005C) say he did the reconstruction in 1980. For the original Chinese text see 大雅. For the original Chinese section titles see 大雅. Further comment above; based mainly on Zha Fuxi's Guide, 8/80/131. (1525; III/216) 9T; a bit different: "corrected" version of 1525? (1573; #27) Same as 1585? (1692; fac/) Same as 1647? (early Qing; XI/160) 11; HZD; "奠譜" => "鄭譜 Zheng tablature"